I created the background with several Distress Oxide inks and then stamped the Inkadinkado image in black onto it. I layered the patterned paper and the stamped image onto the card base. I cut the Trick or Treat sentiment from a piece of printed cardstock. I distressed the edges of the image and sentiment just by running scissors over the edge of the paper until it got a bit ragged. I adhered the stickers that really look like candy along the right hand side of the card (it must have flown out of the trick or treat bags!). The Shopping Our Stash Challenge #204 is Red, Red Wine. I decided to pull out a nice, wood-mounted stamp I’ve had for a long time for this occasion! I colored the image by applying Distress inks and blending them together, then spritzed it with the Perfect Pearls mist for a nice sheen and a couple of drops of water. Unfortunately, it is difficult to see the effect in the photo! Adding the mist and water gives it a little bit more of an aged look to the vintage image. The strip of trim is from an old Basic Grey pack I also had in my stash. Thanks for visiting today. I created this card with the Operation Write Home Mid-month Throwdown in mind. 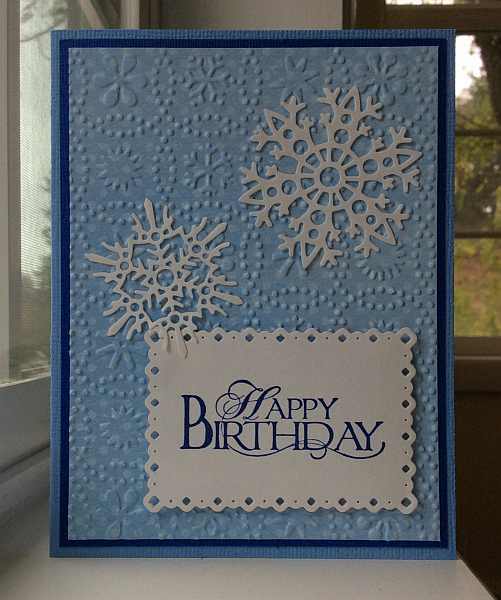 The challenge is to make a Winter birthday card and I immediately thought snowflakes. I used an embossed background featuring snowflakes and added a couple of die cut snowflakes as well. Even the edge of the sentiment die cut fits in with the lacey snowflake look. Thanks for stopping by today. Halloween Kitty Tag = Spooky! Today I present you with a spooky Halloween cat with some sparkles for good measure. I created this for the challenge at Friday Mashup (Friday Mashup 181) which was to create a card with a tag, or one with bling, or one that featured both. Well, this fit the requirements for both. 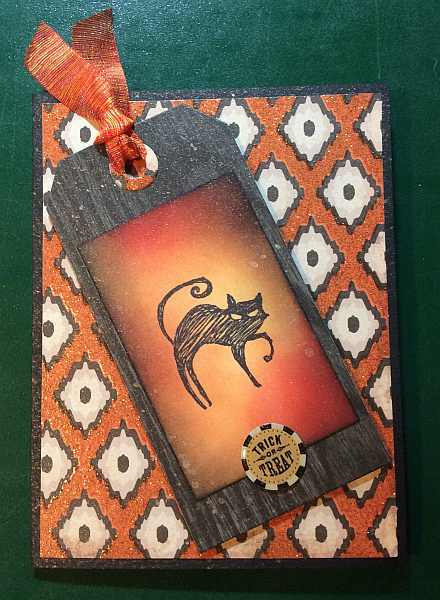 The patterned paper had lots of sparkle (not sure how clear that is to see in the photo) and I created a cat tag, distressing the background with Ranger Distress Inks. I also spritzed the whole card with Perfect Pearls Mist for some additional bling. The whole card is quite spooky in my opinion! 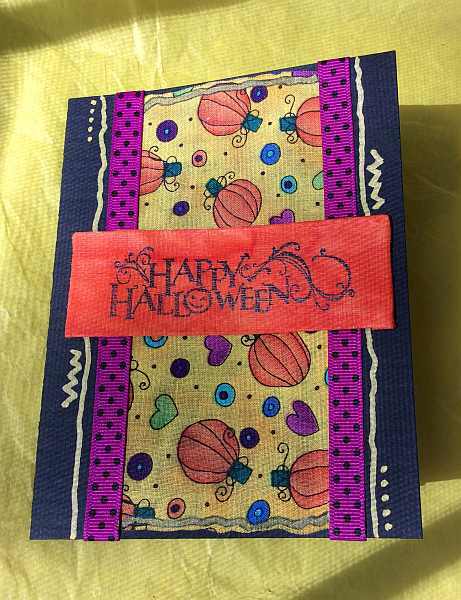 In honor of World Card Making Day, Mixed Media Mojo has a card making challenge to make a card with a Fall/Halloween theme using some fabric. I made a pretty funky card, but it was fun to do and stretched me to use some fabric. 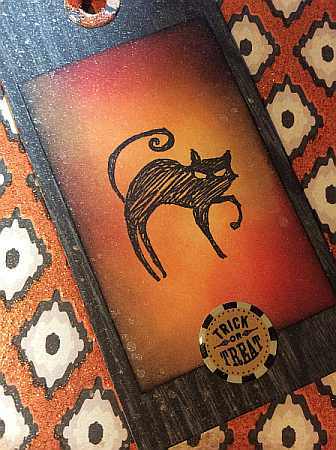 I covered some cardstock with orange batik fabric and then covered it with gel medium–that way when I stamped the Halloween sentiment on it, the ink wouldn’t bleed into the fabric. I also like the texture it gave the fabric. I then attached the pumpkin fabric to heavy black cardstock and covered the outside edges with some ribbon. Before I attached the sentiment panel, I drew some lines and dots with my trusty Molotow metallic gold acrylic paint pen. I drew along the top and bottom of the pumpkin fabric as well and then outlined it with a Micron pen. These Molotow pens really apply the paint in a steady stream–I love the white one as well. 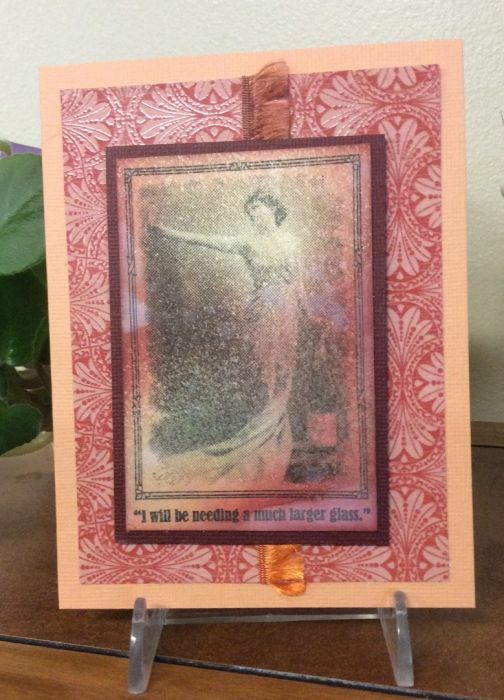 I popped up the sentiment panel with dimensional adhesive to finish the card. Thanks for visiting. 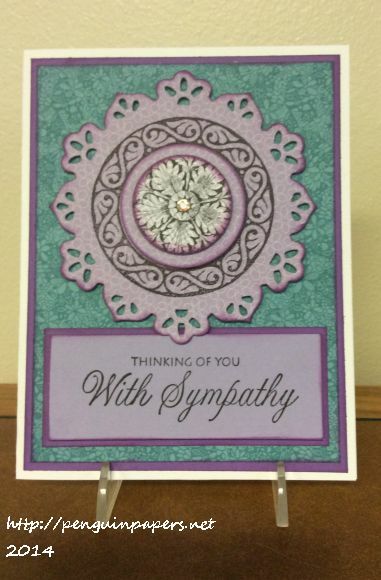 I’ve had to make too many sympathy cards lately. For this one, I used a stamp set I’ve had for a long time to create the “rosette.” I stamped the two pieces on a couple of different tone-on-tone patterned papers and then cut out and popped up the pieces in different layers. It made the design a lot more interesting. I then edged everything with some purple chalk ink to tie the pieces together. Thanks for visiting.